Hello friends! Welcome and thanks for stopping by...You found us for a reason. We are the largest independent distributor of power converters and most of our other products in North America. All of our products are brand new. Our toll free line is open every day and most evenings so if your not sure which converter or other product you need, please give us a call. We promptly answer Emails too so if you have a question and would rather send it via email, drop us a note through the "contact us" link. If you take the time to contact us, we promise to respond. We understand you may have an upcoming adventure and need your product fast. We'll make it happen. We offer lifetime support. When you trade with us, we are partners for life! If you ever have a problem with a product you have purchased from us, just pick up the phone and call. 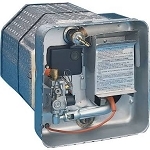 The Converter/Charger is the heart of your RV's electrical system. Installing a modern multi stage converter is the single most important upgrade you can do for your RV. 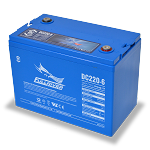 Great for flooded wet cell, AGM or LiFePO4 Lithuim batteries. Progressive Dynamics new Pure Sine Inverter is ready to ship. The latest Ultra III conversion kit. Simple drop-in, "Plug and play" 3-stage converter/charger replacement kit for the Magnetek, Parallax, Phillips or B-W Manufacturers 6300 or 7300 Series converter/charger. 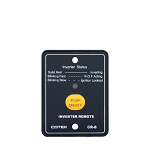 Simple to install and includes mounting plate, DC fuse board, wires, and screw set. Also includes the popular book Managing 12 Volts by Harold Barre. Dont forget to look at the photos for the installation procedure. 3-stage charging voltages are perfect (14.4 boost, 13.6 nominal, 13.2 float) Compatible with standard lead acid or AGM deep cycle batteries. Two-year warranty. "Knowledge is (DC) Power!" The Trimetric battery monitor will count and total the exact amp hours discharged from and returned to your battery bank. 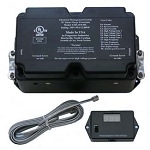 This is the most accurate way to continuously monitor the state of charge of any deep cycle battery. Know exactly when to run the generator and when to stop. No more guessing. A real time "fuel gauge" for your batteries. 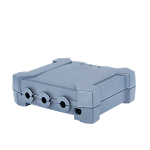 Works great with any solar system or the new Trimetric SC-2030 solar controller. Great for Boondocking! The leading cause of power converter and other electrical failures is a power surge from either shore power or generators. Protect your investment with one of our Progressive Industries surge protectors. 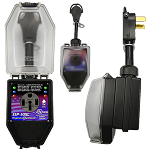 For FULL coach protection including low voltage,A/C compressor delay, frequency, accidental 240 VAC, etc,consider a Portable or Hardwired EMS Lifetime Warranty! We have replacement power centers and converter/chargers for many older units including Magnetek, Todd Engineering, Litton, Newmar, Phillips, B-W Manufactures, Elixir, Centurion, American, Atwood, Iota, Luminex, Systems Monitor, and others.